This print has free UK post but I use 'Airsure' or 'International Signed For' for international orders so chose UK or international below to purchase the John 'Hopper' Hopkins fine art print. If an international buyer wishes to purchase more than one print then please contact Billy with your requirements and one invoice with one International shipping fee will be sent to you. 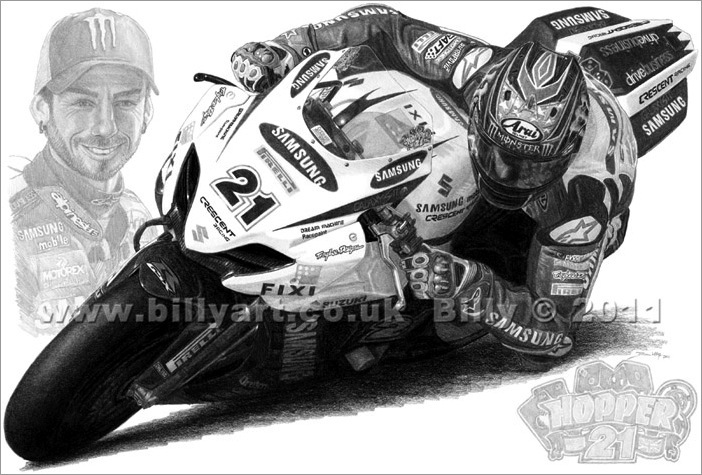 This limited edition print of John Hopkins riding the Samsung Crescent Racing Suzuki GSX-R in the 2011 MCE British Superbike Championship by Billy is art and not a photograph. The drawing of John Hopkins took Billy about a week to complete and would make a great addition to any John Hopkins fan's collection. The John Hopkins limited edition print riding the Samsung Crescent Racing Suzuki is of 100 prints signed and numbered by Billy and has worldwide shipping included in the price. *The fine art print of John Hopkins has free UK Post and Packing. International orders have an additional cost as I will use Royal Mail 'Airsure' or 'International Signed For' to ship them. Simply use the drop down button by the BUY NOW to select the size print you require from either the UK or International prices.